ICAI, Institute of Chartered Accountants of India, has announced the result for CA Final and CPT Result 2017. The exam of CPT i.e. Common Proficiency Test was conducted in this May 2017. Know here how to check ICAI CA Final Result and CPT Result 2017. Many candidates were appeared for this year of CPT examination as well as for CA Final exams. The CPT candidates were prepared for CPT test series and attended many mock tests for CPT examinations. As CA Final candidates strongly get ready for their final CA exams. From here you can come to know and easy ways to check CA July result 2017 to check for ICAI CPT Result and CA Final exam result 2017. If you have appeared for these, the result of CPT and ICAI CA Final result are now available online to check. The ICAI also shared the merit list for CA Final exam. More than lakh candidates were given the CA final exams and nearly 90,000 plus students have appeared for the CPT test of ICAI. 1) You can check the CA CPT or CA Final results by online. 2) The second method is by mail or directly from your mobile. Here's how you can check CA Final result 2017 & CPT exam results on your mail. > Go to icaiexam.icai.org and log in with your registration, you have to verify your email id. > Then, Login to your registered profile and know your CA Final or CPT results. All candidates can get their ICAI CA CPT or CA Final Exam result of June 2017 on mobile through SMS. You just need to type CACPT followed by their six-digit CPT Roll Number and do send an SMS to 58888. For ICAI CA Final May 2017 result candidates need to type CA FINAL followed by their six-digit CPT Roll Number and send it to 58888. 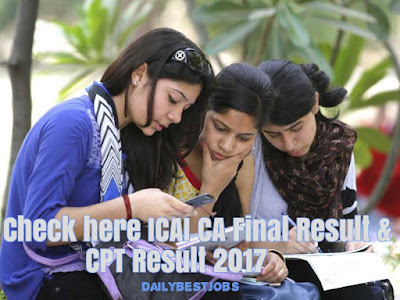 Share this article with your friends if they were appeared for last CA Final or CA CPT Exams to know and check the results of ICAI CA Final and CPT Result 2017. For more result updates, you can subscribe below by putting your email address and get a free job and result updates directly to your email id.